Want more articles like this? 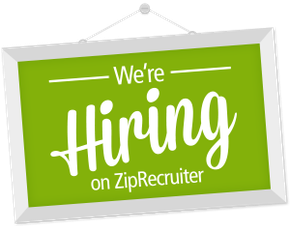 Click here to subscribe today. 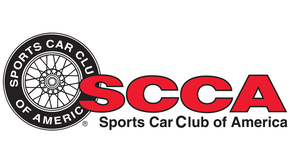 Reaching beyond age, race, color and gender, our shared love for all things with wheels melds auto enthusiasts into a sort of extended family unified by common beginnings. When a bunch of motorheads descend upon a vacant parking lot for a Saturday morning Cars & Coffee, it doesn’t take too long before those origin stories begin to arise. While the details will vary, most of these tales begin with a single, significant vehicle that ignited the passion. 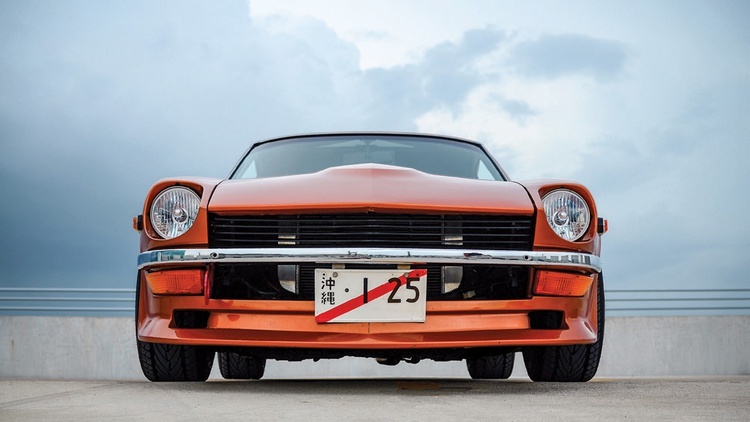 Nissan product planner Jonathan Buhler found that spark in his father’s beloved 1973 Datsun 240Z. Jonathan’s father, Edward, purchased the Datsun from the original owner in 1979 for use as a daily driver while he was stationed at Naval Construction Battalion Center Port Hueneme in Oxnard, California. For his son, the stories of Edward driving around Southern California in the Z, dressed in a Navy uniform and with the sun shining through the aftermarket sunroof, rivaled any of the superhero cartoons that filled the imaginations of his grade school buddies. Jonathan’s parents would meet and marry, all while his dad continued to accumulate miles on the Datsun’s five-digit odometer. In 1984 they would pack up the tiny hatchback and move to Atlanta. 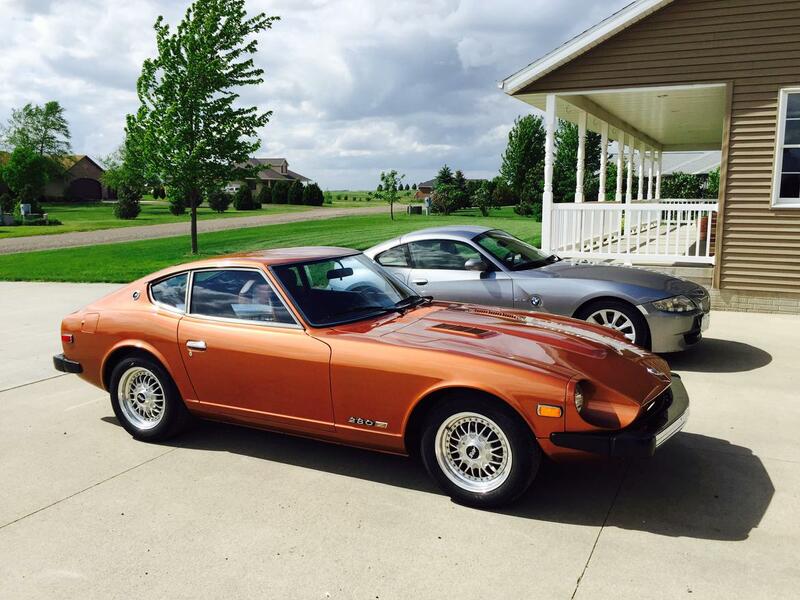 When Jonathan arrived on the scene in 1990, his dad was still using the 240Z as his primary vehicle. 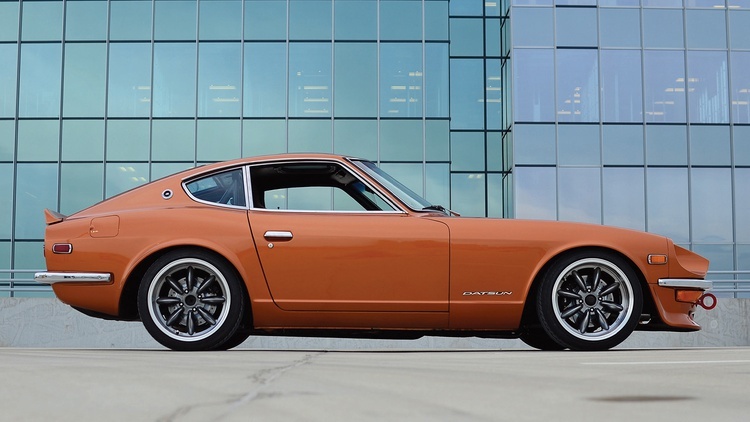 However, as bulletproof as Nissan’s design was, without continual driving and maintenance, relying on an aging Z-car can become a bit of a crapshoot. The Datsun was parked in a garage in 1998. It would lie dormant for seven years. Fast-forward to 2005, when Jonathan would turn 15 and begin shopping for his own car. While many of his friends were investigating modern muscle cars, European coupes and lifted trucks, Jonathan’s shopping focused on vintage Mustangs. His dad took him on an adventure or two as they dug through classified ads and investigated potential leads. While the search was a gift in itself, their trips were fruitless. Before too long, a solution presented itself that had been there the whole time: Why not restore their 240Z to its original glory? While the Z wasn’t in showroom condition, it still represented a well-sorted vintage vehicle with a known history. The two of them grabbed a copy of Motorsport Auto’s catalog and marked the pages with a highlighter, planning the build and adding up the costs. Jonathan’s dad loved the idea, but had three stipulations that would govern the build. 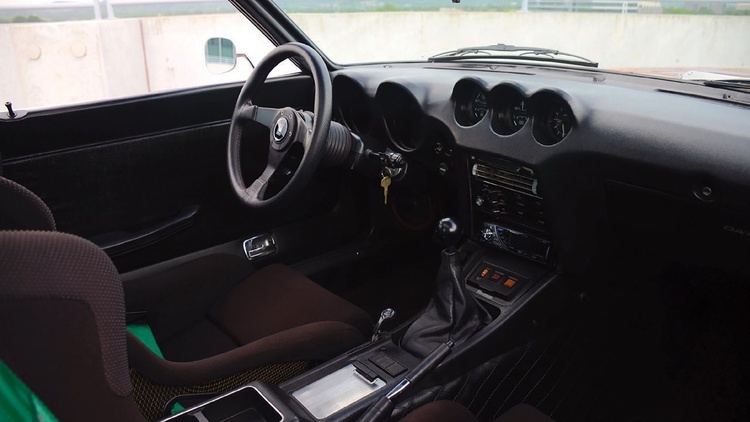 In order for him to hand over the keys, the 240Z would need to stop without hesitation, be relatively safe to drive, and the power would need to be controllable after the modifications were done. The father and son began a restoration that would last until 2008. During that time they would strip the car, tear down the engine for a rebuild, repaint, and “finish it enough” to get it back on the road. Jonathan’s buddy Alan Smith, a Nissan master mechanic, helped with the project on weekends. When they tore down the L24, they didn’t encounter any cylinder wall scoring. Matter of fact, the engine hardly looked like it had been run at all, a testimony to the stout engineering of the 2.4-liter powerplant. In keeping with dad’s blueprint for success, the stock braking system was refreshed and the interior got an Autopower roll bar as well as a pair of lightweight Bride carbon-Kevlar racing seats. 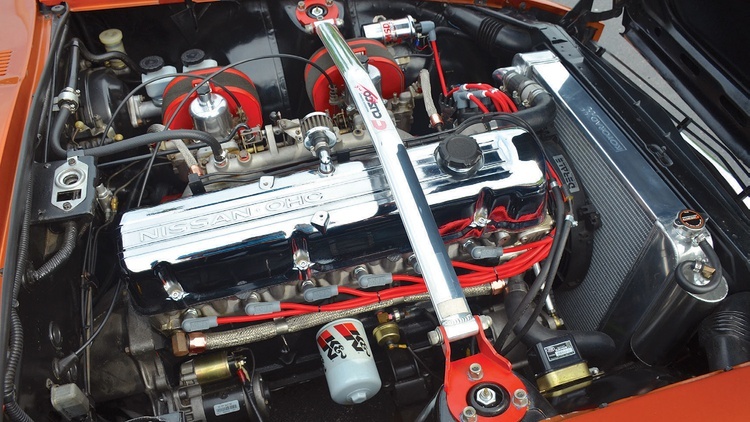 The stock ignition system was replaced with an MSD coil, a Pertronix electronic ignition and new spark plug wires. They also upgraded the suspension with five-way Tokico Illumina adjustable shocks, Eibach springs, and a Suspension Technique front anti-roll bar–although they have since moved to Techno Toy coil-overs front and rear. The build was successful for the most part, although Jonathan reports that they never seemed to get the car’s downdraft Weber carburetors to run correctly. 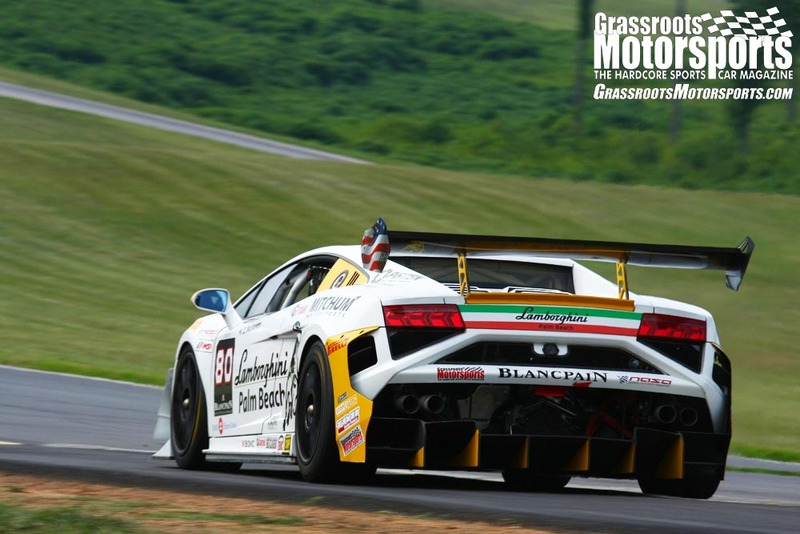 Whether it was the tune or defective parts, their rebuilt engine was only able to produce 88 horsepower on the dyno. On the bright side, that number was low enough to meet dad’s requirement that the car offer “controllable” power. The upgrades would shine on the track, though, and both father and son loved to wring out the Z at nearby Road Atlanta. The Datsun also made a strong showing at the 2007 NOPI Nationals, where it took second in class to a 1971 Nissan Skyline. Every good story needs a little conflict, and in April 2008, on Jonathan’s 18th birthday, the Datsun suffered catastrophic brake failure. Vigorous downshifting helped him avoid injury and worse, but Jonathan still went off the road, hitting a guide wire in the process. A little investigating revealed the culprit to be a crimped stainless brake line. The fender bender took out the Datsun’s front fender and headlight scoop. The car was quickly back on the road thanks to some junkyard body panels, a pair of Arizona Z Car control arms, and a set of new Watanabe-style wheels from Rota, the RB, in a 17×8.5-inch size. Jonathan continued in his father’s footsteps, taking the 240Z on dates with his future wife, Lauren, and later using it for their wedding get-away. 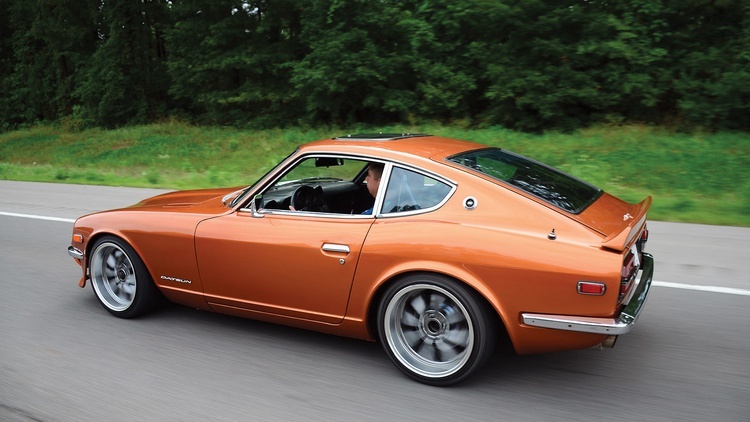 She would fall for Z-cars, too, quickly purchasing a 280Z that she’d soon trade for an earlier 240Z. (Coincidentally, her Z was built during the same week and on the same line as Jonathan’s.) Together they’d finally take care of the old, barely adequate powerplant in Jonathan’s 240Z, replacing the original 2.4-liter engine with a 2.8-liter grabbed from a 280Z. The aging four-speed was also pulled and exchanged for a five-speed unit from an early-’80s 280ZX. A Centerforce Stage 2 clutch was added before reassembly. Jonathan’s passion for all things Nissan doesn’t end there. He pursued a career with Nissan and landed a job at their corporate headquarters in 2012. 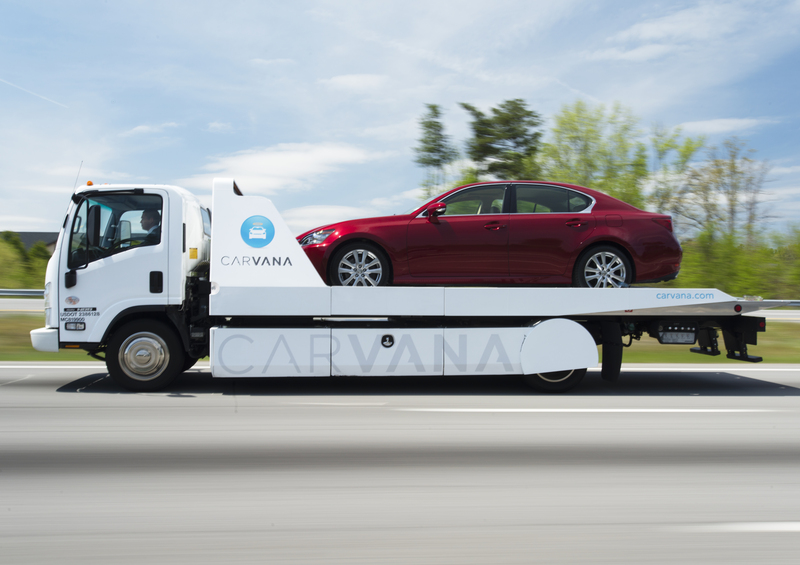 He now works in the product-planning department and recently toured the U.S. in support of the all-new for 2016 Maxima, a vehicle he helped create. He’s also become a curator of the Nissan Heritage Collection stored at the Lane Motor Museum in Nashville. Like the cars in that museum, the family Z is now used as an informal ambassador of the Nissan brand. 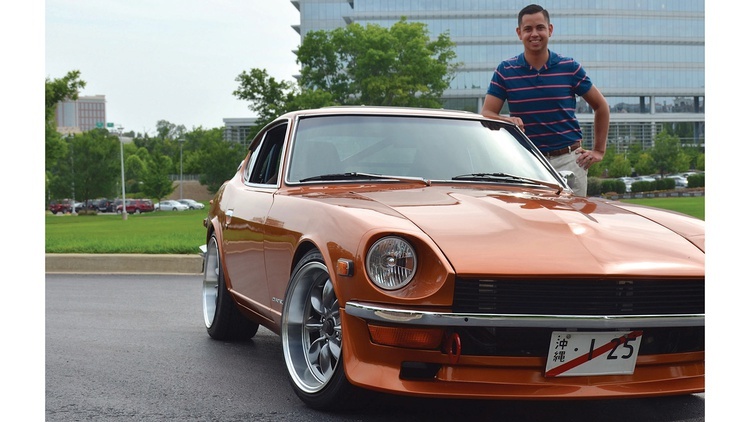 Last summer Jonathan drove his orange 240Z, along with a caravan of Nissan Heritage vehicles and the all-new Maxima, to the International Z Car Convention in Memphis, Tennessee.